The consumer point-and-shoot camera has just been reinvented—not tweaked, or remodeled, but actually re-thought from top to bottom. A Silicon Valley start-up called Lytro is shipping this week a camera that looks like no other and actually lets you focus or refocus your pictures on a computer after you take them. This $399 camera, also called Lytro, can do all this because it is a so-called light-field camera, which is based on a different technology from traditional digital cameras. In simple terms, it uses a modified sensor, plus proprietary software, to capture and process more, and different, information about the light hitting its lens than other cameras do. This includes the direction of light rays. The result is a richer picture file that software, on the camera and on a computer, can use to manipulate images in new ways. Lytro doesn’t even classify its camera by the familiar megapixel measure. Instead, the company says it has a resolution of 11 megarays—in other words, it can capture 11 million light rays. Just as the technology is very different, so is the camera itself. It looks sort of like a short, square, pocket-size telescope, with a nonprotruding 8X zoom lens on one end and a touch-screen viewfinder on the other. It has only two buttons and a zoom slider. It starts instantly and is instantly ready to take the next picture, because it doesn’t need to perform autofocusing. It can be purchased in three colors at lytro.com. The base model can hold about 350 pictures. There is also a $499 model that can hold 750 pictures. The company provides a free desktop app and a free online service, where you can view, share and manipulate the pictures. I’ve been testing the Lytro and found it does just what it says. I was able to take rapid-fire shots that looked good on my computer, and that could be focused and refocused, uploaded to the Internet and shared. I consider it a revolution in consumer photography, with more benefits to come. 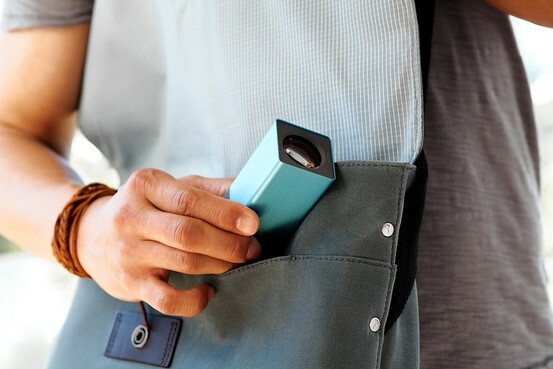 The Lytro camera is lightweight and small enough to fit in a pocket. The pictures can be exported into the standard JPEG format for use in other software, but then they lose their ability to be refocused. Also, the company is still working on tools for editing the photos, so, for now, you can’t do common things like cropping, or changing brightness or contrast. The camera lacks a flash, though this is partly offset by its unusually large f/2 lens, which is always fully open, letting in a lot of available light, even when zoomed. Also, the camera doesn’t come with a charger. You have to charge it, slowly, by plugging it into a computer, or, more rapidly, by using one of a list of approved chargers from other devices, such as an iPhone charger. Importing the pictures can be slow, because a lot of processing is involved and the files are relatively large—about 16 megabytes in my tests. Photos you “star” on the camera as favorites get processed first. But the main drawback to the Lytro I discovered is that it takes a while to learn how to spot and frame pictures that show off the camera’s refocusing abilities. Also, in many common situations, such as taking a simple picture of a single face or object, the refocusing ability just doesn’t come into play, since it works best when there are multiple objects arranged so that some are in the foreground and some are in the background. The company offers videos to help you learn this new type of photography. In them, for instance, a host advises that it is good to get very close to an object in the foreground—so close, that it looks blurry in the viewfinder. One is at http://vimeo.com/37336723. You can see the refocusing in action at a sample gallery at Lytro.com. After a few days, however, I was able to get interesting pictures whose focus could be changed to bring out details. For instance, I took a picture of a cup of coffee perched on a car hood. Afterward, when I tapped on the viewfinder on the image of the coffee, it became sharp. When I next tapped on a blurry concrete-and-brick step in the background of the photo, it suddenly became sharp—instead of the cup—and a crack in the concrete that hadn’t been visible appeared. In another case, I took a shot of a bush about eight feet in front of a fieldstone wall. With a simple click, I was able to make either the bush, or the wall, crystal clear. When I uploaded these pictures via my Mac to Lytro.com, the company’s free photo-sharing site, or to a test account on Facebook, I was able to change the focus again—even on a Windows PC or an iPad—and so will my friends who see them. You can email friends links to your Lytro.com photos. The Lytro took almost no pictures that were out of focus. But in a couple of cases, where I was more than six inches away from a simple object that was out of focus, clicking on it brought it into focus. However, the Lytro can’t correct motion blur. There are two shooting modes. In Everyday Mode, the optical zoom is limited to 3.5X, and the area in which refocusing works is fixed. In Creative mode, the Zoom is at the full 8X, and you can tap on the viewfinder to set the point around which the picture can be refocused. 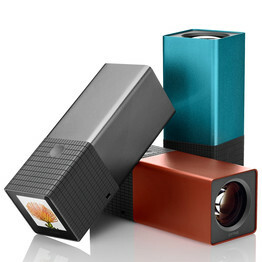 The Lytro comes in three colors, with the red version capable of holding 750 pictures. The battery is sealed, but battery life was good. The company says you can take 400 to 600 pictures, depending on usage, between charges. The camera is 4.4 inches long, 1.6 inches in height and width, and weighs about 7.5 ounces. I found it fit in a jacket pocket easily. The front of the camera is aluminum and the rear is rubberized. The power and shutter buttons are on the rubberized part. So is a touch slider built into the surface for controlling the zoom. The touch screen has only a few icons, which you make visible by swiping upward. One swipe changes from Everyday to Creative mode. In Everyday mode, tapping the viewfinder image sets the exposure. The Lytro is an exciting and novel leap in digital photography, but because it still has some missing features, like flash and a file format that works in other software, buyers should consider it a second camera, at least for now.